Grantley Konrade began working for Tyree Ag in August 2016. He is a Kinsley High School graduate and has experience working for Tech Stimulant Services in Benton, KS from 2009-2011 and later for Baker Hues in the oil industry in North Dakota from 2011-2016. 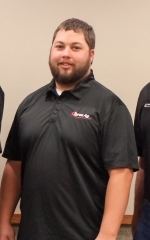 Grantley has his CDL and Hazmat & Tanker certifications and currently resides in Kinsley, KS.